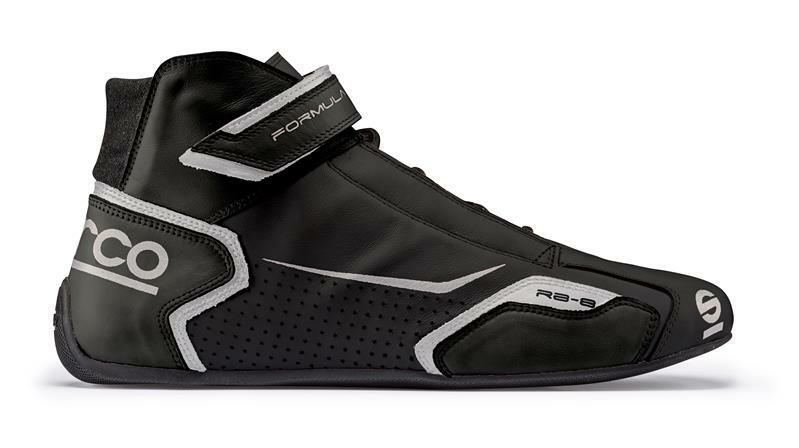 Sparco Racewear - Competition Shoes - Formula RB-8 UNIVERSAL - Lesher Motorsports, Inc. The Formula RB-8 is an all-new driving shoe for 2016. The Formula RB-8 was developed using feedback from Sparco’s professional drivers. This development program created some unique features for the new shoe. The Formula RB-8 has the next generation sole made in pure lightweight rubber which enhances the pedal feel and is also anti-static, fuel and oil resistant. The mid-boot design features a full ultra-soft calf skin leather upper with perforated vents. The upper has a Velcro strap closure and Speed Laces for better support and adjustability (standard laces also included). Another unique feature of the Formula RB-8 is the Achilles stretch panel for improved mobility and comfort. The Formula RB-8 has a pre-formed anatomic insole. The Formula RB-8 is available in 5 colors in sizes 37-48 and is FIA approved.